The Undulating Waves Scarf was my first foray into designing with beads. 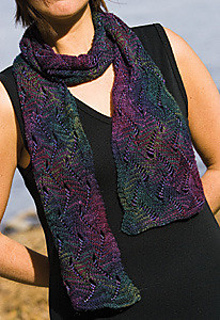 It is based on a lace pattern that has lace stitches on both the knit and purl sides of the fabric. This allows the beads to float on the yarn-overs. Although I have marked this pattern as advanced, you will find that, with practice and perseverance, the pattern becomes quite easy! There is a KAL in the Schaefer Yarn Group on Ravelry that has excellent support and pictures. You will need 100 g Size 6 beads. Identical to #334S; the same .PDF download is available for each version with instructions for each yarn type.